The box set fans have been waiting for. Produced by the Jim Henson company and created by Rockne S. O’Bannon, the series followed Earth astronaut John Crichton on a strange journey across the universe, where he became part of a strange crew of renegades and misfits on the run from several powerful political forces. At first, their struggle was to stay one step ahead of the authorities that were in hot pursuit, but as the series unfolded, we found out that Crichton had been given the knowledge of how to create wormholes–something several political factions in the universe desperately wanted and were willing to do just about anything to acquire. 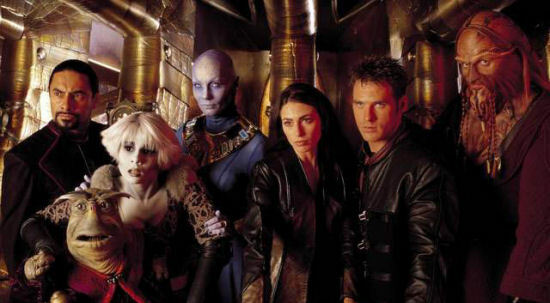 Fascinating and compelling, “Farscape” was the first original series to make genre fans sit up and really take notice of the SciFi Channel as serious contender for original programs. (Up until this point, their biggest claim was remastering and airing unedited “Star Trek” repeats for the first time in years). Over four seasons, the series constantly reinvented itself and its characters with heart-breaking, compelling drama, a unique sense of humor and its own stunning visual style. The series was originally released on DVD during its initial run on SciFi from ADV. The releases were fairly solid at first with some extras and the episodes, though collecting the whole series carried a big price tag. ADV double-dipped with “Starburst” collections that upgraded the episode transfers and offered a few more extras, but were still just as costly. That’s before the series went out of print, leaving new fans to scour E-Bay and other sources to find the discs. Now, A&E has finally done right by this influential and popular series, giving it the box-set treatment it has for so long deserved. It’s also made the series affordable again for fans–old and new alike. At long last, you can have just about all of “Farscape” in one management package on your shelf, along with a wealth of extras that will keep most “Farscape” fans happy for weeks or months. 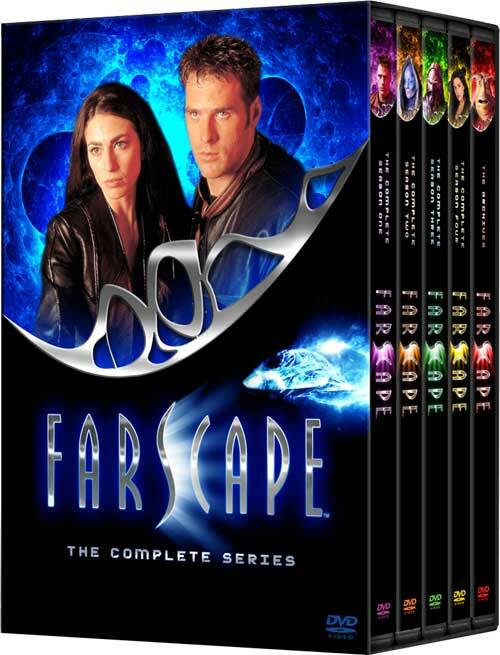 “Farscape: The Complete Series” features all 88 episodes of the show, spread over 24 DVDs. 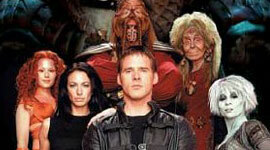 You’ll get all four seasons, individually packaged within the box set (you can buy each one separately if you desire) along with a two disc set of extras, including the long-awaited special “Farscape: Undressed.” Originally produced to introduce new fans to the third season of the show, this catch-up includes some interviews and moments fans have been clamoring for for years. There are also a wealth of extras on the sets, including some commentaries on individual episodes as well documentaries looking at each era of the series’ run. About the only thing missing from the set is a release of the epic mini-series that wrapped things up, “Farscape: The PeaceKeeper Wars.” Some outlets were including this as a bonus for those who purchased early and the good news is that it can be easily and afford ably found at a variety of on-line retailers. (And trust me, if you get to the end of this box set without it, you’ll want it). And while the series had the ebbs and flows any genre show will, overall the quality of the storytelling, the acting and the visuals here are second to none. “Farscape” is one of those rare delights that you will come away wondering why more people didn’t embrace in the way “Battlestar Galactca” was. While the viewpoint on “Farscape” may be a little more hopeful overall, it still journeys down the same dark alley that “Battlestar” did at times. (In particular, the end of season two in which our hero loses everything and there seems to be no hope for him beyond the “To Be Continued” flashing on screen). This new set is worth the investment. You could go for a season or two to sample, but looking around at some holiday deals, you can get all four seasons for the price of a season and a half, so why not take the plunge? If you want to see one of the most well-regarded, fondly-remembered and influential genres shows of the last decade, you owe it to yourself to give this one a try. I’m surprised you don’t have an Amazon or BestBuy link to the DVD set. Thats what I thought clicking on the picture would bring me too. I wish it had a longer run. Right on! What a great series! Farscape set the bar for me in terms of what characterization and storytelling needed to be. I cared about John in a way that I haven’t cared about many characters before or since. I wanted he and Aeryn to work out, I wanted him to find peace, whether he made it home or not. I loved their love story. I’m so glad this set came out this year- I really needed it. Battlestar just made me sad and depressed. 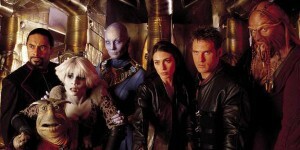 Farscape gave me hope that it coudl get better and that’s what I really needed. they can’t call a show a complete series if it was canceled.the scifi channel has canceled so many cools shows.I won’t bother getting involved watching any of them anymore much less purchase an incomplete collection. I’ve been mainlining Farscape since I got this set (on the cheap — yay, Best Buy!) a week and a half ago. I just finished last night and plan to watch PKWars before I set off to make my family holiday rounds. BTW, this guy, if you get the complete series set and the miniseries, it is a competed story and a wonderful ride. I hope you won’t continue to let your disappointment with the business side of show business deprive you of such an amazing journey.